Practically any yard can benefit from the dramatic improvement that flagstones can provide. We prove exceptional work with flagstones, and can create anything from a simple walkway to a large patio. A flawless installation from our team will leave you satisfied and filled with a sense of pride in your home. Call us at 254-716-8685 if you would like to learn more or schedule installation of a flagstone walkway in Waco and Temple, TX. Flagstone is a top alternative to traditional concrete installation due to its unyielding strength and flexible installation options. It is durable and can stand up to elements like water, UV rays, and extreme temperatures, and it can add an element of elegance to your space. Flagstones are available in a multitude of shapes and colors and can be uniformly cut or randomly designed to accommodate whichever look you’re trying to achieve. Your flagstones can be installed either using loose material or by using mortar. Our professionals can assess your area and provide information and advice to help you choose the best installation method for your project. For a flagstone walkway in Waco and Temple, TX, call us today! We will prep your area by marking the projected path and digging the trench needed for stone placement. Our sub-base layer is carefully constructed with top quality fine grain sand and spread and packed well for minimal movement of flagstones. We place your flagstones in the pattern and width you want and inspect each piece to ensure a smooth, flush installation. When installing flagstone walkway in your Waco and Temple, TX yard, the options can be overwhelming. With choices on everything from materials to installation method, it’s difficult to know which is best for your needs. Our professionals can walk you through the process explaining every option and decision along with benefits and drawbacks to help you make great decisions for a perfect end result. Flagstones come in two basic design styles- squared and not squared. These two styles are made from the same material but offer different appearances and styles. Squared stones can be used for a traditional look with narrow, uniform spaces to create a uniform, smooth appearance. Non squared stones are randomly shaped and are typically used in a more relaxed setting for a more separated, natural look. Your flagstones can be laid with either a dry method or with mortar. Dry laying provides a rustic, informal look with very little installation time. 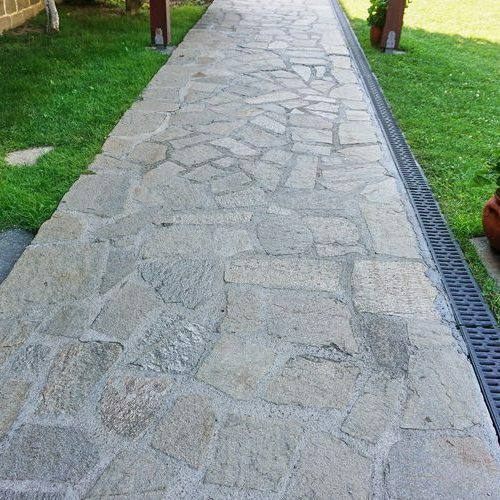 This look is great for secondary walkways and paths because of the “stone by stone” appearance. For a more sturdy structure, mortar can be used between the stones to hold them in place as cement would. Mortar creates a stable, one-piece structure that won’t move or need a reapplication of the stones. If you need more information about a flagstone walkway in Waco and Temple, TX for your property, call us! Finishing coats are available for your mortar laid stones, and can seal and open areas or cracks left in the mortar at installation. It can also protect your flagstones from elements like water, UV rays, and traffic. While flagstone installation can bring a bright, dimensional space to your yard, there are considerations and choices to make first. Our experts can evaluate your area and deliver comprehensive, realistic options for every look and budget. When you are thinking about a flagstone walkway in Waco and Temple, TX or you would like more information on the benefits of flagstone, call our consultants today at 254-716-8685. Updated on April 2, 2019 at 4:17 pm by eSquared Asphalt Maintenance.